While the Death March may have made us a little weary of walking, it didn’t completely satisfy our hunger. And Kevin still had some places on his “Chicago Bucket List” to check out before moving to Syracuse. So the morning after the Death March, we celebrated a successful March with brunch at The Publican (and my college friend Brian joined us again). The Publican is located over in the West Loop, in the Fulton Market Meatpacking District (literally across the street from a meatpacking place). 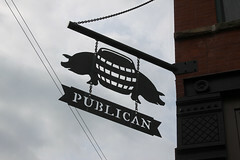 The basic idea of The Publican is a celebration of two concepts: beer and meat products. To that end, they’ve created a restaurant where the very design echos that purpose; the dining area is basically set up as a European-style “drinking hall”, with plenty of bars, taps, tables, and the like. It also is designed to resemble some of the warehouse spaces, so it’s bright and airy. It’s the kind of environment that I’d call warm and inviting, if it weren’t for the fact that it has the acoustics of a warehouse space as well, it was rather loud most of the time we were there (although most of that particular brunch, the music being played was various Beasty Boys songs, in honor of MCA’s recent death, and that actually worked quite well). We had particularly heard that The Publican had a good Sunday brunch, and had also heard that if you got there at least 30 minutes early, the line for walk-ins is tractable (indeed, we were the first people seated right as they opened). We were quickly led to our table, and selected some beverages. I was rather happy to see that in addition to having a full beer menu for breakfast, The Publican has several beer cocktails. 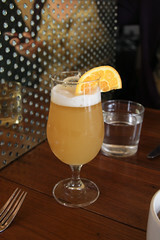 I opted for The Publican “Mimosa”, which is their take on a Mimosa using a Belgian Blanche with orange juice. This was a particularly good pairing, and made for a pleasant start to the brunch. Carol did equally well with her “Gin and ‘Treuse” cocktail, with gin, chartreuse, mint, and cucumber (although alternating that with the mimosa was not a great idea). 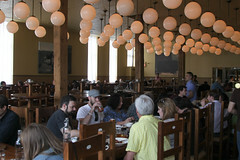 Moving on the to main brunch courses, the menu was basically “meat, with an emphasis on house-cured products”. So pretty much everything involved local or house-made sausages, hams, or other meats. I was very tempted by the pork belly bibimbap, but after a little bit of hemming and hawing settled on the Fulton Streed Quad: two perfectly cooked eggs, half a Toulouse sausage, Ndjua (a spreadable salami), and some headcheese. And a few pickles and such. This was quite a good charcuterie plate, probably edging out the one I had a few weeks ago at Home Hill Inn. The toulouse sausage was nicely textured and flavorful. The Ndjua had a very nice, strong pepper flavor, and had the perfect consistency for spreading on the toast. And the headcheese was a nice, smooth mix of perfectly tender little pockets of salty cured pork. 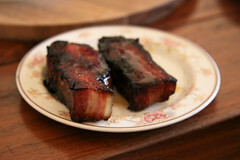 I also couldn’t resist getting a side of bacon (I am a “Professional Bacon Photographer”, remember? So I had to order it for professional reasons!). I’m glad I did, since it came out as a substantial slab or maple-braised bacon, absolutely delicious and falling-apart tender, with good strong smoke notes that were complemented and not overpowered by the maple syrup (I tend to be a little wary of maple-flavored dishes, since so often I’ve been to places, particularly in MA, that seem to like to hit things with the maple hammer, and I’m glad the folks at The Publican could show some restraint). The rest of our party did quite well, too. Carol opted for the grilled lamb sausage served with ramps, piri piri sauce, and turnips, which was topped with some perfectly fried eggs. The sausage was nicely textured, and had a really nice spicing to it. I would have been perfectly happy with it as well. Kevin’s braised pork shoulder looked quite enticing, although I didn’t actually try it. 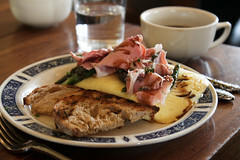 Same with Brian’s omelet, which was an impressive construction loaded with gouda and prosciutto. There are some issues (like the loudness), but The Publican has a very good thing going on. Overall, they had a very pleasing brunch. I’d like to come back to The Publican another time, either for their dinner menu (the brunch menus are printed on old dinner menus, so I could see several enticing dishes listed, like the “taste of four hams”), or heading next door to their deli that had a most impressive case of cold cuts.